Reading FC Women boss Kelly Chambers says her side's displays against top-flight opposition in the cup this year show that they are ready for promotion. The Royals are currently second in Women's Super League Two and need five points from their remaining four games to guarantee they will go up. "The girls have really stepped up against WSL 1 sides this season," Chambers told BBC Sport. "We're definitely ready. They've shown that they can compete in that league." 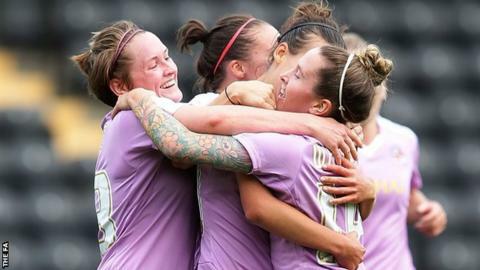 Reading were the only WSL 2 side to reach the quarter-finals of this year's Continental Cup, in which they lost 3-2 to Notts County on Sunday. "My girls train twice a week," Chambers continued. "If I had them full-time, I just love to think what I could do with them if I had them every day." England defender Alex Greenwood, whose late winner won Sunday's tie, added: "I think they (Reading) are a great side. "I said to the girls at the end that I look forward to playing them next year. They pushed us a lot more than some WSL 1 teams did this season." Notts boss Rick Passmoor added: "WSL 1 will be a far better place with Reading Football Club with the way they play and the way that they are managed - they are a credit to their parent club. "Hopefully, and they should, get promotion and we look forward to seeing them in the league next year."